MALIN had a tough outing on Sunday afternoon at Connolly Park with visitors Portglenone running rampant from the throw-in to emerge from an hour’s football with an impressive 13 points to spare over Louis Walsh’s men. 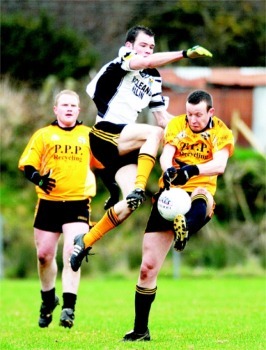 In truth, Malin bore the telltale signs of a team yet to shake off their winter coats while the Antrim men have already accounted for Loughmacrory of Tyrone in this competition and exhibited unexpected levels of fitness for what is effectively a pre-season competition. The Malin manager will extract little more from this encounter than the fact that he has much work to do. In fairness, Portglenone will cause problems for all-comers – their strong running game backed up by a work-rate and physicality all too often lacking in Donegal club football. From the first minute when Gerald McAleese opened proceedings with a point from play, this game was all about Malin being forced onto the ropes by incessant Portglenone pressure. In fairness, the Inishowen men went toe-to-toe with their Antrim foes but, aided by a stiff breeze, it was the visitors who time and time again prised the Malin defence apart to shoot with impunity. That said, the first half was a low scoring affair that flattered the home side, 0-5 to 0-1, thanks mostly to some poor finishing by Portglenone and several impressive last-ditch interventions by right corner-back John McLaughlin. Malin’s solitary score in the first half came courtesy of an Anthony Kelly free. The second half consisted of more of the same. Despite a spirited opening spell by Malin – no doubt spurned on by Walsh’s impressive half-time analysis – Portglenone took up were they left off. Malin’s opening flurry, which yielded points from Paul McLaughlin and Anthony Kelly, were cancelled out within six minutes of the restart and finally the Portglenone scores came thick and heavy. Any chance of a Malin fight-back was scuppered when Paddy Kelly was shown the line with just eight minutes gone. Already on top at midfield, Portglenone now lorded proceedings and with a man to spare, put Malin to the sword. The inevitable goal came on 13 minutes when centre-half forward Paddy Carey blasted past Christopher McLaughlin from close range. Despite forging comfortably ahead on the scoreboard, Portglenone never once lifted their foot off the accelerator and blazed their way to the final whistle displaying superior mobility, impressive support play and an attitude to defensive duties that one of the Malin players afterwards accurately described as “that Northern way of playing”. 1-15 to 0-5 it finished, two Anthony Kelly frees accounting for Malin’s remaining scores. Based on Sunday’s display, perhaps only Clan na Gael of Armagh can halt Portglenone progress in Group D, while Malin will hope to improve in time for next Sunday’s visit to Dungiven. Improve they will, it’s only February after all! For full coverage of all your weekend sport, read the Inishowen Independent.